The Madejski Stadium becomes first venue with dual-use pitch to experience added durability of SIS Pitches’ advanced hybrid system. Reading FC have become the first UK sports club with a dual-use pitch to install the revolutionary SISGrass hybrid system – to help the club’s hallowed turf endure almost 250 hours’ playing time. 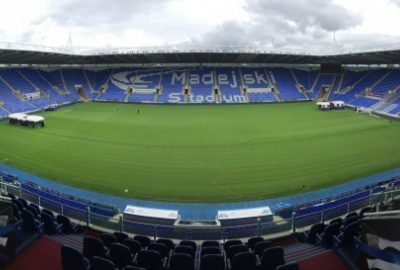 Global pitch specialists SIS Pitches introduced their advanced hybrid turf technology at the Madejski Stadium this summer as part of a full reconstruction of a pitch that staged over 55 matches last season. With the Berkshire venue hosting all home first-team fixtures played by Reading and London Irish, the Aviva Premiership Rugby side that have been ground-share tenants for over 16 years, plus a selection of the Royals’ Under-23s and Under-18s games, the playing surface gets a severe workout. So much so there were times last season that Adam Grantham, Reading’s Grounds Manager for 13 years, and his hard-working staff had to prepare for four matches in as many days. With such little time to recover from wear and tear, the quality of the playing surface inevitably suffered. To manage such high usage, the Sky Bet Championship club opted for the increased durability of Cumbria-based SIS Pitches’ award-winning SISGrass, a reinforced natural turf system featuring patented fibre injection technology. Reading have the added bonus of having SISGrass Universal at their disposal. The compact machine, combining speed, mobility and laser precision, specialises in repairing high-use areas such as touchlines, goalmouths and penalty spots. Main contractor MJ Abbott Ltd were central to the six-week pitch reconstruction project at the ‘Mad Stad’, while Premier Pitches completed the turf finishing process. Adam said: “The pitch was last reconstructed to this extent way back in 2007 and it reached the end of its shelf life last season, becoming ineffective in areas. “Balancing all the football and rugby commitments on an ageing pitch was extremely tough at times and there was some criticism over the winter period, so it was good to start afresh in the summer. “We completely reconstructed the pitch, taking the old hybrid system out and starting from the bottom up, reshaping all the sub-base levels, reinstalling the drainage, the undersoil heating and adding a new irrigation system. “We have been really pleased with both the high quality of SIS Pitches’ service and the pitch they have installed. With the increased durability of SISGrass, we’re extremely hopeful the end result is a much stronger and healthier pitch all year round that suits our manager Jaap Stam’s style of play. SISGrass’ laser-guided installation combines a 95% natural grass pitch with 5% of specially-designed PE yarn stitched into the ground, offering unrivalled durability, improved pitch recovery time and increased playing hours. Phil Blackwell, SIS Pitches’ UK Projects Director, said: “With the Madejski Stadium staging so many fixtures during a season, Reading require the most durable and stable pitch on the market, which we firmly believe our award-winning SISGrass hybrid pitch technology provides. “The installation process went extremely smoothly and we have no doubts that both Reading and London Irish will experience a higher quality and more durable playing surface this season. The ground-breaking SISGrass hybrid pitch system has been installed at prestigious venues across the globe, taking pride of place at six of next summer’s World Cup venues, including the iconic Luzhniki Stadium, which will host the Russia 2018 final. SISGrass has been installed at Premier League duo Newcastle United and AFC Bournemouth, Serie A side Verona and a quartet of Türkish Super Lig clubs. It also features at Championship clubs Birmingham City, Derby County and Fulham and at the training grounds of FC Barcelona, Chelsea, Swansea City, Hull City, Fulham, Derby County and the National Football Centre at St. George’s Park, home of the English FA.